International Central Gospel Church (ICGC) has donated a cheque of ¢200,000 for the procurement of three Electroconvulsive therapy ( ECT) machines for the three major Mental Health hospitals in the country. 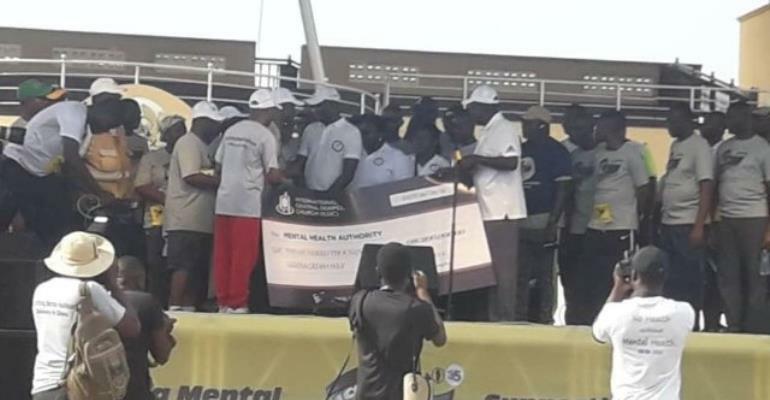 General Overseer of the Church, said figures from the Mental Health Authority ( MHA) shows that the country loses approximately ¢18.55 billion to mentally related distress. Dr. Mensa Otabil revealed that the figures are startling and compelling. Speaking after the 2019 Life Walk health program on Saturday he said this informed their decision to acquire the machines for the hospitals. The ECT machine also known as the 'miracle machine' is a critical life saving equipment for the treatment of mental health patients. With over 41% of Ghana's population battling mental health issues, psychiatric hospitals across the country are overwhelmed with a huge patient to doctor ratio amidst inefficient or non-availability of diagnostic machines. Dr. Akwasi Osei, CEO of the Authority thanked ICGC for the gesture and prayed for the church's continuous support to the country's mental health care needs. Thousands of Ghanaians including church members of the ICGC converged at the Black Star Square as early as 4:30 am for the start of the most attended health walk in Ghana. Starting from the Black Star Square all through some major streets of Accra, the 12-kilometre walk was attended by both the old and young.